I have not played a 2D adventure game since Metroid Fusion for the GBA and was looking forward to getting my hands on the indie-gem Xeodrifter. I have heard great things about this game from Renegade Kid and since I let Mutant Mudds pass me by I did not want to make the same mistake with this one. While I was pleased to play through Xeodrifter on the PS4, I cannot help but feel like chunks were missing in what would otherwise be a masterpiece of a game. Xeodrifter does not stray far from its origins as an 8-bit inspired 2D adventure game. You play as a lone astronaut that is stranded in a part of space with four planets around you. As is standard with these Metroid inspired games, you can access all these planets right off the bat, but you can only go so far in each because portions are blocked off until you receive a powerup that allows you to traverse the entire world. This results in some back tracking, and while that isn't necessarily bad, it doesn't come off well here. I have no problem going back to levels or worlds in order to keep progressing, but unlike other games, Xeodrifter makes it feel boring in some ways. Sitting for an hour or two playing through the game and having to go back through the same areas can get repetitive. Some games like Guacamelee! 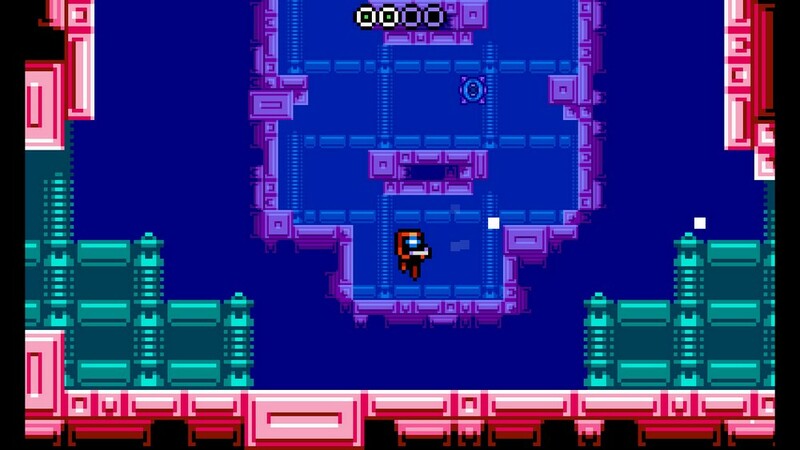 do an excellent job at given you alternative enemies or different powerups on your return trip, but Xeodrifter relies on recycling through the same enemy types in the same position. Having the powerups does allow you to access more of the environment, but this does little to change the actual gameplay. Your main and only weapon is a plasma gun that is very similar to Megaman’s cannon. This is the only weapon you have and the only means to attack. You have the ability to change the characteristics of how it shoots but I think I would rather have had one powerup that allows you to attack enemies in a different way. The one powerup that really is uniqueish is the ability to jump into the background to traverse to different areas. I say uniqueish because this same game mechanic is the main component of the developer’s other game Mutant Mudds, butI really enjoyed having to think if I needed to jump to the background in order to get past an area or attack an enemy. Really the big problem is the game's lack of creativity. As I mentioned before enemies are recycled and there is one in particular that really frustrated me, the giant squid-like creature that you face as the final boss on these worlds. This enemy is a challenge, but it wasn't the difficulty that bothered me so much as the fact it was the final boss every time. Sure, he learns new tricks and tactics that you have to learn in order to beat him again, and yes they give him a different color, but it's still the same boss. Simply changing the creature into a bat, an eyeball, or any other form of monster would have been better. I hate to complain about Xeodrifter because it's a solid game on many fronts. The bit-chip music and tones are on point. The colors and environments take me back to my NES days. The gameplay and flow of the levels are fine tuned. It's just that there's nothing new added to the genre by this game. For what it is, Xeodrifter can be a perfect starting point for someone to get into the 2-D adventure genre as a beginner. It is polished and well made, but it is also simple and minimalistic. While not pushing the boundaries of the genre in any significant way, Xeodrifter is a well made game which is sometimes all we need. 1001 Spikes is far from a bad game, but a few too many spikes on each level leave it falling from grace.